Why is it that when you have a deadline for a project and you work and work and work every spare minute on it and are on track for achieving that deadline that you hit snags. Does the universe pull together to stop you from succeeding? 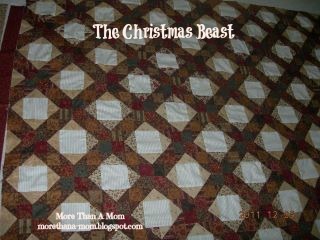 I was "THIS" close to finishing the Christmas Beast king-sized quilt for my parents to give before Christmas day (the 23rd). Picture this, Friday December 21st and I'm on the third border (of four in case you needed clarification) and it's all going smoothly. Christmas music is turned up and I'm really in the groove of things. I've got my head song thinking, I can do this in time if I work late and get up early for the last little bit. Even the binding if I really boot it! 10:00PM - I did it to myself! - I decided to get fancy and change up the thread. I decided to change it up because I'm not quite sure I'll be able to squeeze out the last bit of fabric for the other 1.5 border sides that I need and I think a solid colour would look better on the outer border and yadayada-whatever-reasoning and BAM! The new thread starts to break. Then I realise it's for hand quilting. My bad. I switch it out to a new thread that needs to be put on the frame instead of the machine because it's a big serger-sized thread cone. BAM BAM!! I am getting nesting on the bottom of the fabric. I need to trouble-shoot but I'm deflated and tired now so I decide to leave it for the night. Sadly, I didn't reach the exact goal. My parents understand but STILL it was to be their 2011 Christmas gift, for crying out loud and here I am missing the 2012 deadline too! After a week of holiday, however, and research into what the trouble most-likely is, I am refreshed and determined to return to the quilt and finished the blasted thing. It also helps that while away my mother-in-law and sister-in-law M. graciously helped me figure out the binding (I still need way more practise with measuring and cutting and confidence), and also helped me with cutting and sewing and ironing it so that it is ready to go (once the last of the borders is complete). I can't WAIT to present the final product to my parents and posting it to you all. The good news is, I have been checking out my work (top and underside) and I must say that I am super impressed with how the quilt is coming if I do say so myself. I hope they are as impressed as I am at it's beauty and with the love I have POURED into it. I'm still working on a deadline and it would be ideal to present it to them at my little guy's 5th birthday on January 18th. I can do this!!! Here is a reminder of what the top looks like. Each of the 2"x2" finished squares will have some sort of design on it.